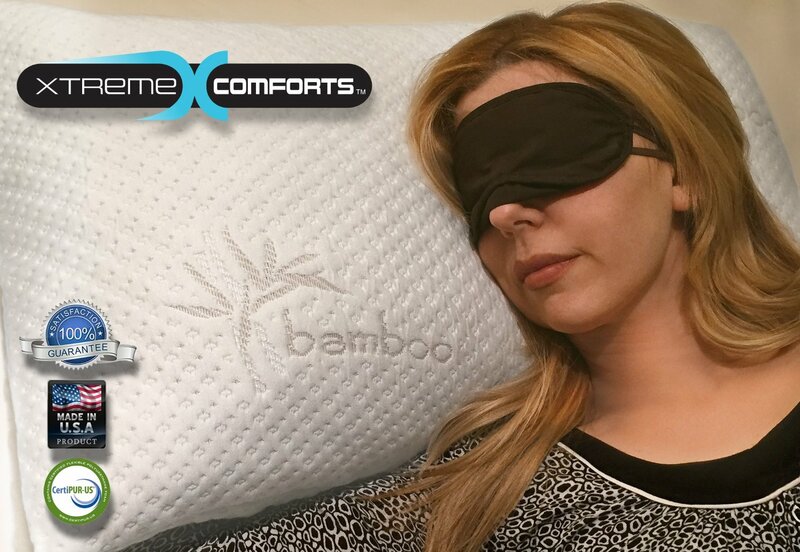 Top Notch Material: Shredded Memory Foam Pillow With Kool-Flow Micro-Vented Bamboo Cover from Xtreme Comforts! Shredded Memory Foam Pillow With Kool-Flow Micro-Vented Bamboo Cover from Xtreme Comforts! Pregnancy. Ah pregnancy makes it hard to get a good nights sleep! I know you Mom's feel me on that!! I am always looking for awesome pillows to make me rest easier and I recently received an awesome one for review called the Shredded Memory Foam Pillow With Kool-Flow Micro-Vented Bamboo Cover from Xtreme Comforts! This pillow is a little firmer than I usually like pillows but I have been very impressed with it! It keeps cool, and holds it shape pretty well throughout the night...and it has quickly become one of my favorites! MADE IN THE USA - Our Extra Breathable Micro-Vented Kool-Flow(tm) Technology Cover That Is Combined With 43% Bamboo Keeps You Cool All Night Long For a Deeper Sleep Through the Night! SUPERIOR QUALITY, COMFORT, SUPPORT & DURABILITY - Your Shredded Memory Foam Pillow Will Never Go Flat! You Can Mold Your Pillow So That it is Comfortable For ALL Sleep Positions. Orthopedically Promotes Proper Neck and Back Alignment to Reduce Tossing and Turning For Back, Stomach and Side Sleepers! 100% U.S. MADE WITH CERTIPUR-US CERTIFIED FOAM - Hypoallergenic & Dust Mite Resistant -- Great For Allergy Sufferers! Rolled and Vacuum Sealed at the Factory For Frustration Free Eco-Friendly Shipping. PROPRIETARY SHREDDED MEMORY FOAM - Guaranteed to Never go Flat and is Machine Washable! Xtreme Comforts Pillows Are Built For Comfort, Support, and Durability! This pillow is truly extremely comfortable and allows your neck to be properly aligned which prevents many chronic issues like migraines, snoring, neck pain and tingling in your fingers! While I still use more than one pillow to sleep with at night, and to get comfortable with, I do love this pillow and feel like I am resting better throughout the night! Like most other reviews I saw, I was shocked how the pillow came rolled up and quickly became a nice sized, fluffy pillow that holds its shape! Overall, I say it is definitely worth the money and works better than many other, more expensive pillows we have tried. This looks like a great pillow, I would love to give it a try. Thank you for sharing this review. This is something I can use! This looks really nice. I often get hot at night and I think a cooler pillow would definitely make a difference. This looks like a very nice pillow. I like how it stays cooler, something my husband could really use. I have been looking for a comfortable, supportive pillow.